McCormick's Imitation Banana Flavor can be used to enhance natural banana flavor and marries up well with strawberry and almond flavors. Try adding 1/2 to 1 teaspoon of banana extract to your next batch of banana bread or to the custard in a banana cream pie. 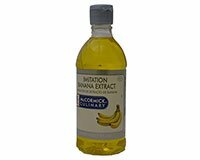 Use imitation Banana Extract to boost the flavor of seafood, Caribbean chicken, chili pepper marinades, sweet heat salsas and sauces, chutneys, relishes and vinaigrettes. Imitation Banana Extract is excellent for adding banana flavor to cakes, cookies, cobblers, pie fillings, puddings, pastry creams, and icings. Ingredients: Water, Alcohol (40%), Natural and Artificial Flavors, and FD&C Yellow 5. Combine all ingredients in mixing bowl. Allow to set in refrigerator for at least 30 minutes before using to allow the flavors to marry together. Serve with pork, chicken, and seafood. Makes 24 2 ounce servings of Tropical Salsa. Add 1/2 tsp Imitation Banana Extract to 2 cups prepared vanilla pudding. Cover an 8 inch graham cracker crust with sliced bananas. Add puddings. Top with whipped cream. Combine 3 cups sour cream, 3/4 cup crushed pineapple, 1 1/2 tsp Imitation Banana Extract and 1 1/2 cups orange juice together. Let set for 30 minutes before using. Toss cut fruit with dressing for a great dessert.